A sunny spot near the back or edge of a garden bed, because tarragon is a lanky plant. A cold-hardy perennial, tarragon can survive temperatures to -20F (-30C). Eggplant. Often planted with thyme and other low, mound-forming herbs. Set out a purchased plant in late spring. The best strain, called French tarragon, is propagated exclusively by rooting cuttings. At maturity, tarragon will need a 3-foot (90 cm) square space. Tarragon covers itself with yellow-orange blossoms in late summer. Gather stem tips as you need them in the kitchen. Tarragon can be dried, or you can use fresh tarragon to make flavored vinegars. 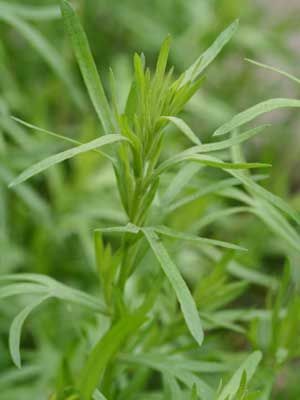 Tarragon has few problems with pests or diseases.